Prescription eyeglasses have become a major demand by majority of the people these days worldwide, as the usage of digital devices such as computers, LED TV’s and mobile phones, etc. are being vastly used by individuals of every age as well as children. But fortunately, there is an arrival of a latest and a revolutionary technology that can highly assist those, who love to see the world clearly than ever before. This latest technology in eyeglass industry is known as Free-Form Progressive Lenses," a groundbreaking digital manufacturing procedure, making use of computer-assisted design and developing to produce a futuristic, customized eyeglass lenses according to your provided prescription. Just imagine that you go for shopping to get a new pair of pants from a branded store, and that is slightly longer or unfitted on you. So what would you ask them? Certainly to get it customized, so it fits perfectly and making you look exceptional. The same thing happened here as you can now get your current lenses customized for particular prescriptions and frames. Standard lenses are mainly the pre-molded lens, having the progressive design formed on its front exterior. In its production, the prescription is created on its back surface and this way the mold is not changed. These are digitally designed that is made via software measuring a person’s prescription and some additional factors like frame fitting position. What is does is it lets them to be modified according to every person rather than simply using pre-molded lenses. If you can recall the very first time you came to see any high-definition LED TV, could you imagine how you compared it with the analog TV picture? It definitely would have appears crispier as well as clear, didn’t it! Now think similarly this matter with your prescription glasses and you will perhaps see more satisfactorily with the lenses you are using, but wouldn’t it be beneficial if you could do advancement to high-definition for your eyes? Excellent Low-Light & Night Vision: These free-form lenses have the ability to decrease the glare and radiance effects produced by light causes in the dark, such as those from a car’s headlights. Extraordinary Contrast Insight: These lenses can even perfect your regular vision. Incomparable Color Vision: Free-form lenses are able to amplify the optics assembled into the lenses, delivering a brighter and strong colors. Knowing the fact that everyone can take the advantage to a certain level from these latest customized lenses, those individuals having a difficult or high number prescription and progressive users could easily observe the utmost visual enhancements. When you go to the local optometrist for eye-examination, they check the eyes thoroughly with digital equipment, which gathers some data from each eye that tells the software to mention the prescription. This will not just explain the refractive fault, but offers some exclusive distinctions for the shape and exterior of the eyes. At the end, the subsequent prescription delivers the finest equilibrium of each eye’s vision, along with better-quality night time vision. Right after selecting the frame, a number of new dimensions are prepared, such as how near from eyes the frame will sit on the nose, how frame will cover-up around face, and also the way you incline your head. 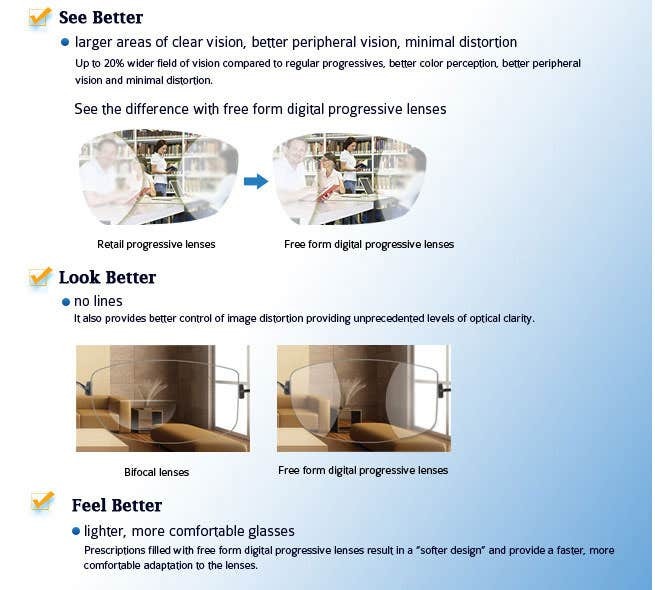 All such modified measurements guarantee that when a person use the free-form progressive lens eyeglasses, their vision will be as precise as it was designed to be. After the above procedure, the order goes the production lab where they form the lenses in world’s high-1uality robotic-driven, free-form machine, which has the capability to read and even retort the advanced prescription written to the 100th part of a diopter. This way, the lenses are made for variations in the eyes through the surface of both eye lenses. Such a great process will not just assist in better & clearer vision, it would help to see in an improved manner across more from the lens. Having appropriately advanced machines these days, it has become effortless to convert the length of the lens form to its appropriate height as desired by the user’s selected frame. This can benefit the efficacy of the dominant viewing regions deprived of unreasonably optical performance. This way, the user can completely enjoy adequate reading value through the major observing zones imaginable, irrespective of any frame size. 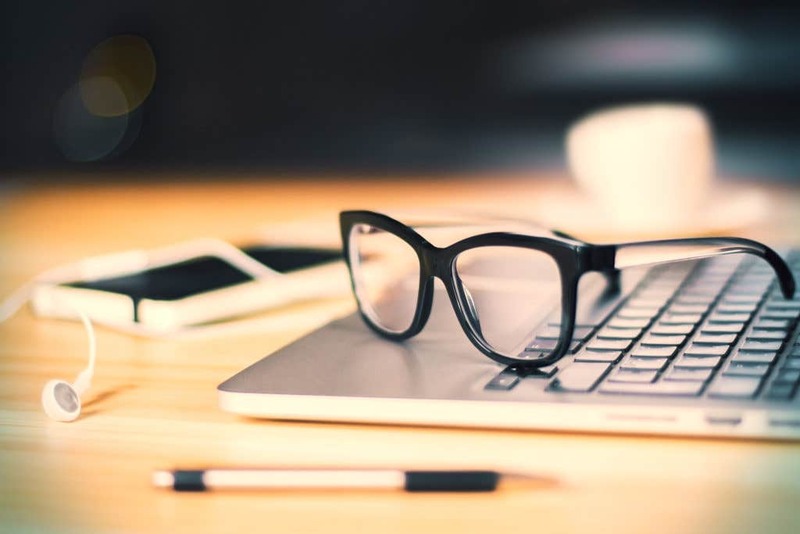 At Goggles4u, one of the top-ranking online prescription eyeglasses stores, is now offering Free-form progressive lenses and other well-known and demanding lenses at best prices guaranteed. Call, email or chat live with their representatives if you have any query regarding your new or existing order, and they are always there to answer all your questions with full satisfaction guaranteed.